Home / "How to" Luxury Bed Sheets & Linens Tips / Make your bed look and feel like a 5 - star hotel bed! Make your bed look and feel like a 5 - star hotel bed! Luxury hotel bedding is not a new concept. There is also no reason your bedroom shouldn’t look like it belongs inside a five-star hotel. You can have the same luxury surroundings you would get in a 5 star hotel, without having to leave the comfort of your own bedroom. Watch the below video to see how you can easily achieve this same look inside your home. Hotel bedding is not a complicated concept, nor is it pretentious. It is actually quite the opposite; keep the bed simple, uncluttered and basic. Many beds found in homes are piled with pillows. Having to remove several items off your bed every night can become a bothersome task. Hotels have taken some great steps to de-clutter the bed. The better brand hotels typically use white as the color for their bed sheets and duvet covers. There is a reason for this. An all-white bed is perceived as clean and it is easy to tell when its not clean. An all-white bed is easy also easy to decorate around. After all, everything goes with white. It is also no coincidence that white sheets are the most popular selling color linen. They just have a clean, fresh look to them. The Westin deserves credit for raising consumer awareness among down comforters and duvet covers to the masses, as this combination is extremely comfortable to sleep under. The ensemble is light, airy and easy to make. However, some hotels cut corners when it comes to bed linens. These hotels claim to use luxury bed linens, but many of them are made in Asia from lower grade materials. It may come as a surprise that many of the Westin’s sheets and duvets are actually made in Asia. However, the Westin’s higher-end properties, like its Central Park (NY) hotel suites, generally use Italian linens. The best sheets & bed linens are Italian made. It is a known fact that Italy produces the finest luxury bed linens in the world. Italian bed sheets may cost a little more money, but the difference is very noticeable. So, if you have ever stayed at a Westin outside of Central Park and enjoyed it, imagine having an even nicer bed ensemble. The majority of Italian bed linen producers use some of the finest grades of cotton available anywhere in the world. Many linens made in Italy are also meticulously finished with decorative details, such as hem-stitching. Most five-star hotels use layers to create a wonderful, inviting look to their beds. This includes the use of soft cotton linens, cozy warm down comforters and several comfortable pillows, which are usually down or a combination of down and feather. This makes for a truly make a wonderful sleep experience. Mattress pad (or a feather bed). Fitted sheet, flat sheet & pillowcases (Italian of course). Down comforter (covered with a light sheet weight Duvet cover). Two, four or even six sleeping pillows (down or feather down - not synthetic). Sleeping pillows should always be covered with a pillow protector that is placed underneath the pillowcase. A decorative pillow or decorative throw is optional as either one can add a splash of color against the large white duvet cover. 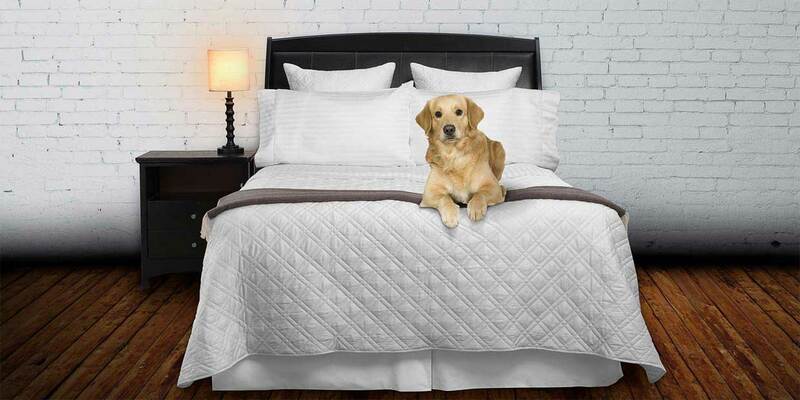 Vero Linens has everything you need to make your very own five-star bed. Select from our fine Italian linens, cozy warm down comforters, luxury duvet covers and feather sleeping pillows. When you are ready to lay down in luxury, look to Vero Linens for all your bedding needs. View 150+ bedding related articles & videos on our “How to Tips” page here.